Karen's coaching experience allows her to skillfully conduct various numbers and skill levels of students within her clinics. All skill levels are welcomed and included but the more advanced students will be asked to perform a task in a more challenging way (from a different position, from farther away, faster, slower, with intensity, etc) while beginners will be asked to try from an introductory level. Participants without a horse (auditors) have just as much access to the learning structure, but without the hands-on practice and live coaching from Karen. Many people have a strong visual / audible learning preference and learn quite effectively by observing all day. Everyone participates equally, whether you’re inside the arena or not. No two clinics are exactly the same and depend on who shows up and what you're ready to learn. 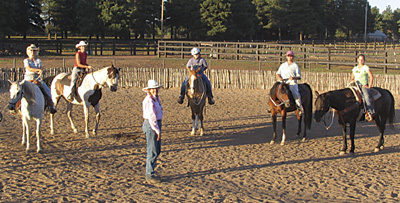 For you who attend a clinic, practice at home, and then attend another clinic (and another) will progress through the following stages as you develop your horsemanship skills under Karen's coaching. What are the qualities of a true leader? They're NOT controlling, demanding, micro-managing, manipulative, coercive, bribing, whimpy, or even dominant. Horses are naturally attracted to humans posessing the true qualities of leadership; those who have an idea and are skilled at communicating that idea to others in a way that invites a willingness to participate rather than being forced to comply. As leadership skills are established, it's important to advance our skills to build more confidence. Most people have a level of confidence until conditions change. By advancing our skills, our confidence will expand to handle even the unexpected or unforseen situations. With the strong foundation of leadership and expanded confidence, the next natural stage is a progression towards trust. Every relationship can be measured by the level of trust between two individuals. 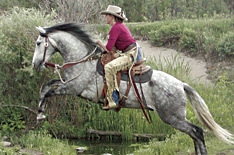 By challenging the skills first established in the leadership and confidence stages, a much deeper level of trust emerges as we further strengthen that special bond with our horse.